PARTNER NEWS: Carta Worldwide is preparing to welcome leaders from across the payments and financial technology industry to the first Mobey Day in North America, to be held at the Four Seasons Hotel in Toronto from 7-8 December. The event will bring together speakers from PayPal, IBM, Transferwise, SecureKey, World First, Visa, Mastercard, Trov, CaixaBank and TD Canada Trust to discuss and understand how to change consumer behaviour through new mobile payment experiences. Mobey Day Toronto will also play host to the Visa Bank of the Future UI/UX Challenge, where millennials are invited to design a completely new banking and payment app that integrates a suite of Visa Developer APIs. The winning team will collect a cash prize of C$15,000 (US$11,131) and a potential opportunity to work with Visa to build a prototype of the winning submission. “Toronto is definitely a new fintech hub on the world stage and we can only expect this position to grow even stronger after Mobey Day,” says Giles Sutherland, VP of strategic alliances at Carta. 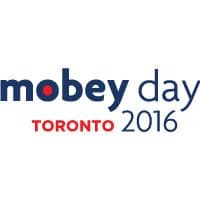 Mobey Day Toronto registration is free for members of the Mobey Forum and C$900 (US$668) for non-members. NFC World readers can save a further C$200 (US$148) on the usual ticket price by entering the code CARTA200 when booking.